A US showroom has received items in the new Ink Blot White Deep Indigo print and Groove Pants that appear to be solid Deep Indigo with Ink Blot Waist. I’m thinking this is what we will see on Monday, or maybe we have to wait till Thursday February 1st before we see these new items released. I haven’t decided yet if I love this print or if it’s going to be like the Unicorn Tears which I initially really liked and then later really disliked. I think I’d love to have an Energy Bra in this print. It’d look really fantastic layered under a solid bright colored Cool Racerback Tank. 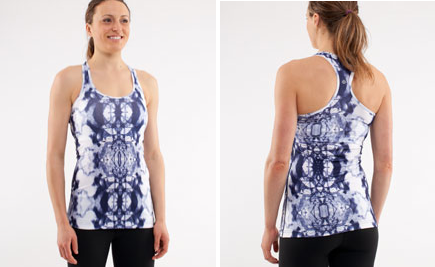 "Push Ur Limits Tank in Deep Indigo/Wide Bold Stripe/White Deep Indigo"